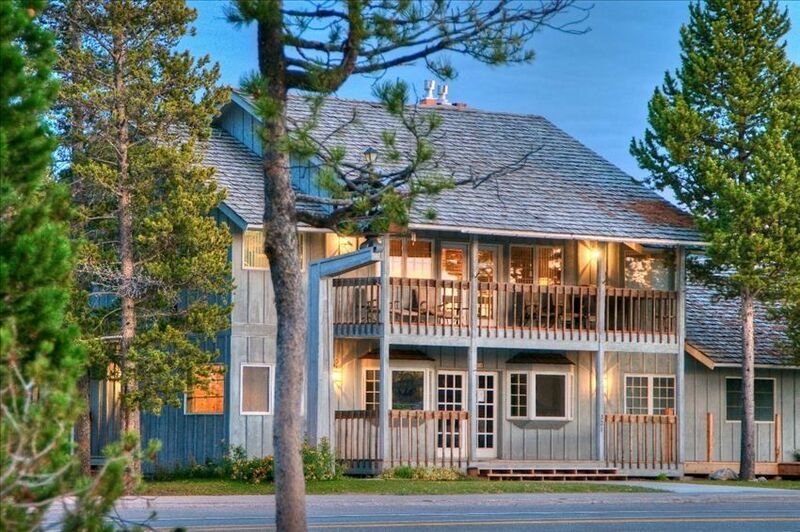 Luxurious Rental Next to Yellowstone Park. Close to Downtown. Park the car or snowmobiles in the 2-car garage. Take off your wet waders and put them on the automatic air dryers before you even go inside. This has it all. Call now to reserve your time in heaven! Easy in town convenience! Within walking distance to shops, restaurants, fly shops and entertainment. toilet, combination tub/shower, Very Nice! toilet, Downstairs next to garage entrance! Within walking distance to shops, restaurants and entertainment. Space in the garage as well! There are plenty of towels onsite for your use. washer and dryer onsite to freshen them as you would like. 55" TV and Satellite as well as DVD Player..
Keurig Coffee Maker with a few pods for that first morning. There is also a drip coffee maker if you absolutely have to have that special blend you brought with. Everything you need but the food! Some spices etc. on site to get you started. Two-car garage, wine fridge, blender, satelite TV in bedrooms, Corian countertops, Tiled master shower. I think you will find this home very comfortable. Within walking distance to downtown shops, restaurants etc. We couldn't ask for any better stay than what we received. Windows for outside veiw was great. Comfortable beds! Heated garage was wonderful for the guys to work in, and to leave snow gear in its own area. We will definetly stay here again. Awesome, I am so glad you enjoyed your stay with us. We appreciate you staying at the White Heron. This was a great space with an ideal location. The added bonus is the large 2 car garage for gear and vehicles! My family and I decided to do a last minute trip to Yellowstone. I spent almost a week wasting time with a couple of people advertising availability at the WorldMark nearby. Responded to 4 ads claiming availability, only to find after a day of back-and-forth email, no, they really did not have availability. I found this rental after wasting my time with people promising WorldMark rentals. What a world of difference! Ads often say "All the comforts of home". Gee, I wish my home were this comfortable. First, the manager, Rocky, was awesome to work with. This rental was super convenient. Parking garage was great! The bedrooms were comfortable and spacious. The living room and kitchen area was huge. We only had 4 adults and a child in our party, but it was a great fit for us. Especially after spending 2 days on the road driving. The kitchen was nice, modern, and well equipped. The satellite TV kept the kid occupied when we were there. Fast WiFi access which was nice because I still had to keep up with the outside world. This rental is right next door to an excellent Spanish restaurant. The Chinese restaurant across the street was good basic Chinese. The grocery store was 2 blocks away. Lots of shopping and great restaurants within a 3 minute walk. Finally, the deck off of the kitchen / living room. Every morning, I sat on the deck, read my email, drank some coffee and relaxed before another day of exploring Yellowstone. The rental fronts on to a busier street, but it was still nice. And, the rental was quiet. And, convenient! Out of the garage, on the street, and in the entrance to Yellowstone in 5 minutes or less. Thanks Rocky for providing a great experience. It was really hard to leave West Yellowstone. I hope to be back and stay in your rental again. We would like to thank you for your kind review. We do try to think of everything to make your trip the best it can be. We are constantly adding little things that either we find or are suggested buy our great clients so it gets better all the time! Safe travels in all your adventures!! 2 blocks from the park entrance. 2 car garage with 2 openers so cars are secure. An amazing rental - Beds were extremely comfortable, kitchen was beautiful and had all the appliances, pots and pans, dishes for our 6 guests. The living room was beautifully furnished. Dining table outstanding. 2 bathrooms and master with indoor jacuzzi for up to 2 that was great. I am so glad you enjoyed the White Heron Vacation Rental. Its all about being completely comfortable when you are done with the days adventures! Our family of 5 adults stayed for 3 nights. We love the house! It was fully stocked with everything we needed and decorated very nicely. We’ve stayed at many vrbo’s and this one above all was truly well stocked and in the best location possible. It is just minutes from the west entrance to Yellowstone with good restaurants and grocery stores within walking distance. The house had a great layout and was perfect for our family. We also appreciated the use of the garage. The owner was very quick in responding to any questions we had. I highly recommend this vrbo! Thank you for the kind review! We are proud of the White Heron Rental and hope that folks find it very comfortable. Enjoy your travels wherever it takes you! We had a great time in Yellowstone and really enjoyed coming home to such a comfortable house every night. The house is in easy walking distance to restaurants and stores, but not so close that you get all the street noise. We ate at the Slippery Otter twice - the burgers are great. We got up early and did about 15 miles a day of hiking to see the sights in Yellowstone. So many incredible and unique things to see. I highly recommend hiking to Fairy Falls, then continuing on to the back country Imperial Geiser. This was a perfect vacation for us. We needed some time away from day-to-day life and this was a great escape. The house was easy to access and had everything we needed. THANK YOU for staying with us. We love to show off our neighborhood (Yellowstone Park). It is an amazing place. We try to make sure you have a comfortable place to rest each night so you are ready to go each morning. West Yellowstone is home to the Grizzly & Wolf Discovery Center. An educational and entertaining facilty with live bears, wolves and birds.